When you are told “Your baby has eczema” these words leave you feeling numb at first and then slowly the dread starts to creep in. So many questions are rushing through your head. Will she grow out of it? Why does she have eczema? Is it my fault she has it? To many people, having eczema might not seem like a big deal, it’s just a bit of dry skin, right? But my husband and I have seen how much it can affect people’s lives. As parents and pharmacists, you understand the effects any condition can have on everyday life and the battles people with eczema can face on a daily basis. The constant itching, the blood-stained clothes and bedsheets, the sleepless nights tending to her sore, inflamed skin. Eczema is known as a disease of the skin, but it’s not only the skin it effects. It can affect the mental health and wellbeing of not only the individual but those close to them as well. Long-term suffering impacts the quality of the lives of the people who have it as well as those of us who care for them. Even though our daughter was only 6 months when she was diagnosed, we were already worrying about what the other school children would say and if she would get teased. After most of our eczema-related questions were answered, the doctor recommended a few creams to us and by the end of that day our bathroom cabinet was lined with a selection of creams, ointments and even bath additives. We tried everything. During the day, her arms were slathered in paraffin-based creams and wrapped in cling-film to keep it there and at night the same was done with ointments. We did this for months on end and just when we thought her eczema was getting better, it would flare up and be worse than it was before. The doctors said they would prescribe topical steroids but we didn’t want to use them unless we really had to as we knew about the long-term effects and didn’t want to expose her to them. It was a never-ending cycle that we just couldn’t seem to escape. So we decided it was time to take matters into our own hands. After doing lots of research we found that many of the emollients that we had been using contained irritants and sensitisers, such as parabens and SLS. We realised that it was these additives that were causing her eczema to flare up and preventing it from healing. So, using our background in pharmaceuticals, we looked into developing our own range of emollients that were free from the following common irritants and sensitisers SLS, parabens, fragrances and colours. Which brings us to today. We’ll admit, it’s been a challenging journey but seeing the positive impact our range has had on eczema sufferers all over the UK, including our daughter, makes it all worth it. Eczema isn’t a curable skin condition, not yet anyway, but the emollients you apply, along with a few other factors such as food and lifestyle, can help to make living with eczema more manageable. Our daughter still has the occasional flare-up, but that’s because she’s still learning that applying her cream whilst at school as well as at home is key. It’s a hard one as when she’s at home we apply them liberally and regularly but while at school its down to her. She’s slowly realising that she doesn’t need to be embarrassed about applying her cream in front of her friends and with their support she has begun to overcome these barriers. 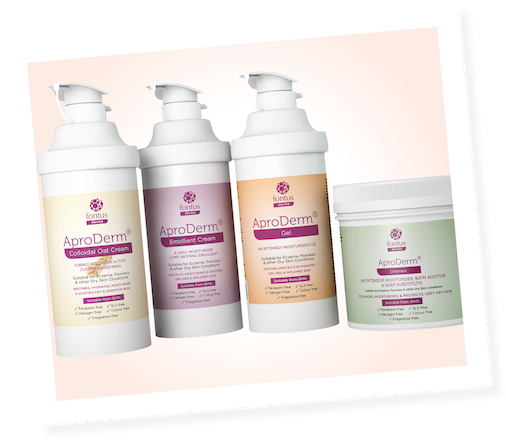 She has experienced how our creams can help and often comes home and says there’s a child at school with eczema can you speak to their mommy about AproDerm® so that they can be helped too. I guess the moral of our story is that there is hope. Yes, our daughter will probably live with eczema for the rest of her life but with the help of our emollients, the support of friends and family as well as perseverance we know things will get better and our little girl will be able to focus on the more important things in life. If we can offer one piece of advice, make sure you apply the creams often and even when your (or your child’s) skin gets better keep applying them, to reduce the risk of flare-ups. Thank you for taking the time to read our story, we hope it’s helped you in some way and please feel free to share your own stories below, so you can be a part of this journey with us. Leave your comments below and post via the Facebook icon to keep up to date with what others are saying too. conditions such as eczema and psoriasis.